Once in every six years, your local parish church is required to prepare a new church electoral roll. That means everyone has to come off the existing roll, and re-apply. In St Weonards, we need to complete this exercise by 18 March, ahead of our Annual Parochial Church Meeting on 2 April 2019. The Electoral Roll is your parish church’s register of electors. In the same way that being on the civic Electoral Roll allows you to vote in parliamentary and local elections and referenda, joining the Church Electoral Roll means that you can vote on Church matters, attend the Annual Parochial Church Meeting (APCM) and stand for election to the PCC. Although most of this beautiful Grade 1 listed building dates from the 16th century, parts of the earlier 13th century structure are still visible, particularly the chancel arch, lower part of the south wall of the nave and the inner doorway of the porch. The Mynors Chapel was built in 1521 and Sir Richard Mynors still lives in Treago Castle just down the road. There are a number of interesting features in the church and the remains of a 15th century cross in the churchyard. The tower has six bells which are regularly rung. The facilities in the church include a kitchen and an accessible toilet. St. Weonard is shrouded in the mists of antiquity but may have been a local hermit and/or a woodcutter -- he may also have been the same person as the Welsh St Gwennarth. For more information on our church, please refer to our visitor leaflet, or visit the National Churches Trust's Explore Churches website, or the Herefordshire Through Time site. If you're visiting, we'd love to know how much you enjoyed your visit: why not leave a comment in our visitor's book, or submit a rating and/or comments via our Explore Churches page? For a few photos of St Weonard's Church, take a look at our Gallery page. It costs over £400 per week to keep this church and churchyard open, and contribute to the costs of our parish vicar. We remain completely reliant on generous donors and fund-raisers to meet these costs -- we receive no money from the government, county or parish councils, or the central church. Just interested in making a one-off donation? That's still really helpful. Just click through to our give.net page, or contact our PCC Treasurer to ask about other ways to make a donation, including leaving a gift in your will. Confidentiality is assured. THANK YOU -- your contribution, of whatever size, will make a real difference to the church and our outreach. Finally, if you'd like to learn more about the PCC's charitable aims, activities, achievements and finances, please take a look at our last annual Report & Accounts. 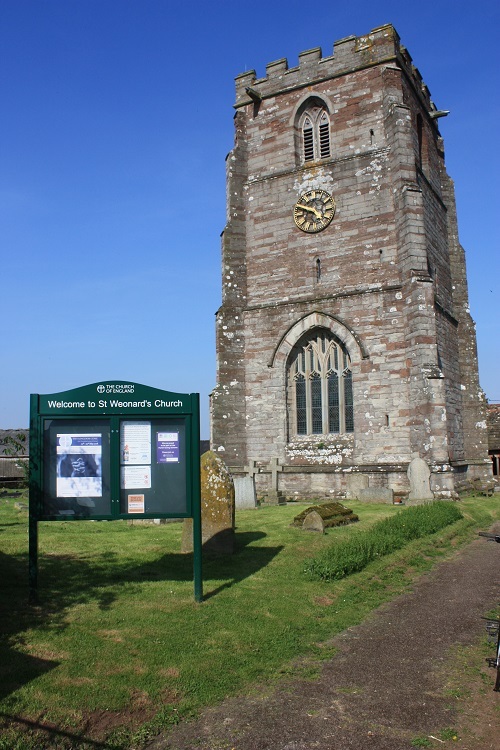 St Weonards is on the A466 about 10 miles south of Hereford and 8 miles north of Monmouth. Follow the Parking sign off the main road and (if you're driving) park in the village car park, then walk back past Church Farm and enter the churchyard through the west gate. The main entrance to the church is via the south porch. Please keep the bird guard mesh doors closed to prevent our feathered friends from getting stuck inside! Thank you.